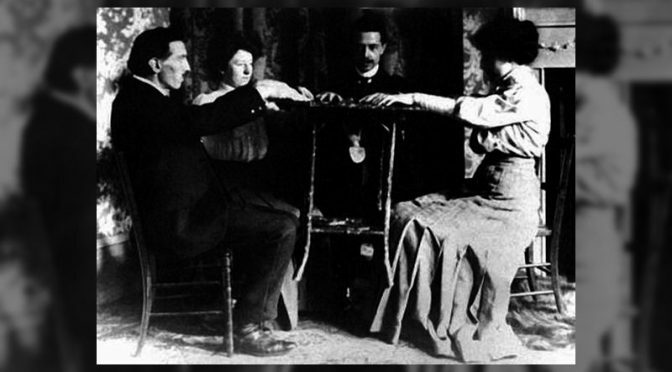 One form of physical phenomena known to the Spiritualist community is Table Tipping. Tipping provides a means to communicate with spirit. I have over 30 years of practice in this discipline. The accuracy of the spirit team working behind the scenes always amazes me. When practicing this exercise, a group of people gather around a circular lightweight table upon which they place their hands lightly, saying aloud a positive affirmation to open the séance. The group then sings happy songs and the table begins to move. Rocking slowly at first the table eventually starts jumping up and down in a roundabout manner. Table Tipping offers a first step towards experiencing more profound displays of spirit energy for beginners who wish to work with physical phenomena. To practice at home I suggest gathering a group of four or five people and choosing an evening that agrees with everyone’s schedule. One tip for ensuring the success of these events is to make sure that everyone who joins the group has the same mission in mind. When gathering the strength to bring spirit through the table groups can use an alphabet to communicate. One of the sitters states the letters of the alphabet aloud while others take notes of the words as they are spelled out. Spirit will pause between words. Patience leads to successful practice as good tilting requires time and dedication. Click here to read more of Dwanna’s incredible Table Tipping experiences! For Table Tipping séance appointments and information please contact Dwanna at 972.735.8188.